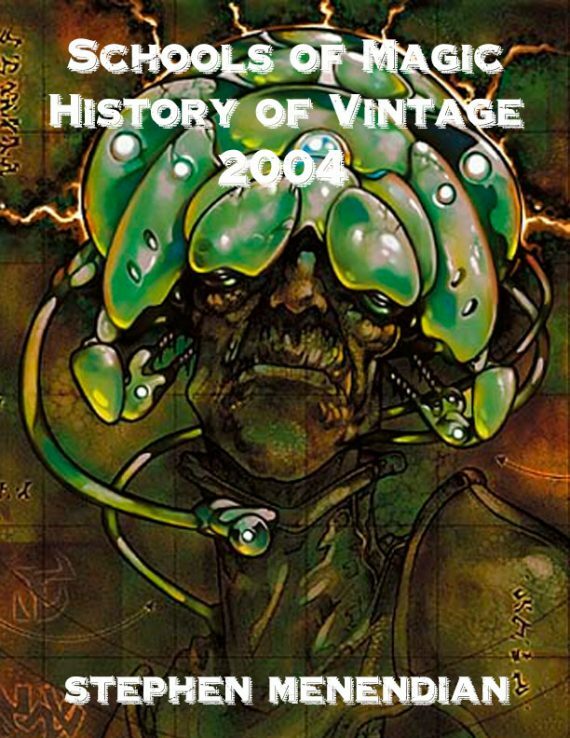 With this epic installment of his History of Vintage series, Stephen recounts the decks, tales of glory, and mighty tournament contests that defined Vintage in 2004. This was the year that Type I was rebranded as “Vintage,” the 2nd Type I Championship at GenCon, and the emergence of the StarCityGames Power Nine Series. It was also a fascinating year in which cards like Gifts Ungiven, Trinisphere, and Forbidden Orchard were printed, and in which Doomsday was unrestricted, and once again broke out with a mind-bending combo. This chapter reveals all this, and much more! For a game that was barely into its second decade, the Type I format was already regarded as a retreat for the game’s older heads. Nostalgia was baked into the Type I experience, and the larger and more powerful card pool was thought to slow the circulatory effects of new set release printings on the evolving metagame, so that popular strategies and Schools of Magic remained enduringly relevant. While the introduction of the Type I Championship in 2003 and the pockets of community and tournament support that had erupted in North America and Europe were welcome developments, a succession of dramatic shifts in the metagame were viewed with growing alarm by long-time community members, who lamented accelerated game play and the presence of “netdecks” in increasingly competitive tournaments. The introduction of Mirrodin had inadvertently brought these matters to a head. With more than its fair share of Type I playables, Mirrodin not only introduced elements that would form the core of multiple new strategies and push the boundaries of acceptable power with many Type I applications, but the new card face and artifact color palette was a grating reminder of the game’s continuous, and sometimes unwelcome, evolution. The DCI handled the most recent metagame developments with a third set of restrictions in 2003, which took effect January 1, 2004. Although only Chrome Mox from Mirrodin joined the list at this point, the artifact-themed Mirrodin would ultimately result in many more restrictions. The artifact-themed block would exacerbate fears of O’Brien School, Workshop-fueled prison strategies. The main target with this restriction, however, was the Restricted List Combo School’s latest and most powerful expression: Burning Academy (aka Burning Tendrils, aka Long.dec. ), which used Burning Wish and Lion’s Eye Diamond for fast and consistent access to Yawgmoth’s Will, a burst of storm, and a lethal Tendrils of Agony.